Time: 10:00am – 12:00 p.m.
Join Certified Zentangle® Teacher Rosie Hill at Coos Art Museum on Saturday, June 18, 2016 from 10am. 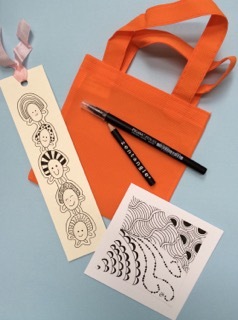 to 12pm for “Zentangle for Kids”. Zentangle is an easy to learn method of creating beautiful images from repetitive patterns. All ages can do it and kids love it! The process builds confidence, improves focus, inspires creativity and requires very little supplies. This class will introduce basics of Zentangle. Many fun “tangles” (patterns) will be taught as students are guided in creating amazing works of Zentangle Art. And everyone gets to keep their kits so they can keep on tangling. Children of all skill levels are welcome. Class size is limited to 12 participants. Class Fee: $15 CAM members / $20 non-members. Registration ends June 18, 2016.